Forgive me. I am about to rant. I just . . . I just don't even know anymore. This Daily Mail article has a good discussion of why this product is so problematic (as if it's not already pretty clear), pointing to both the obvious reference to slave shackles and--as one dissenter noted--the allusion to the "prison industrial complex" (check out this infographic that compares education and incarceration spending, if you want to know more about that particular problem). "This form of political correctness is getting on my nerves and once again, somebody is fishing for attention here by interpreting something into that fashion bit that is not there. Yawn"
When I started the petition against Kraft's MilkBite commercials asking Kraft to stop portraying multiracial individuals as flawed, I received similar pushback. Commenters told me "people like me" and my "PC-ness" were "destroying America." One man told me my concerns made him want to jump of a building if "this is what the world is coming to" (and I was the one overreacting!) People say that they're "just commercials" and the Adidas sneakers are "just shoes." Look. I'm not telling you that you have to be offended over the same things I am. I'm not even telling you that you have to be offended by anything, ever. If you truly believe that all of these objects are "just" objects with no impact or referential value to the world around you, then you have that right, and I imagine that your life is indeed a lot simpler than mine. I'm not trying to take that away from you. But that's not what I believe. I believe that these images and products are part of our culture and that our culture matters because it's not only a reflection of ourselves but a direct influence on our future. We internalize these messages and use them to inform the way that we view the world. So when people tell me to stop worrying about a commercial or a shoe because there are so many "real" problems in the world, it's precisely those "real" problems I have in mind when I'm complaining. Things do not get that bad in a vacuum; the ideas start somewhere. So if you're not offended by sneakers that feature shackles around the ankles, I'm not going to tell you that you should be. You have the right to your own interpretations and experiences. But I am also not going to sit idly back and watch as people come forward in droves to try to intimidate and silence the people who are offended. Because do you know what? When you do that, you're not just taking the neutral stance you pretend to be, you're consciously perpetuating the problem. 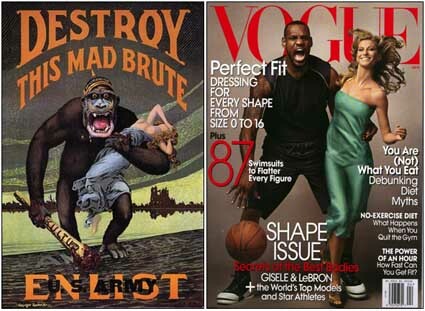 You're actively trying to maintain a culture where images like these are acceptable and if you truly didn't think that those images had meaning, why would you be so invested in making sure that no one complains about them? So go ahead. Tell me that I'm ruining the world with my oversensitivity. Tell me that these are "just shoes" and "just commercials" and "just advertisements." Call me names. Try to shame me into silence. Everything I've learned about the world tells me that images have meaning, and I'm not going to forget that simply because it is too disrupting to a narrow-minded worldview perched upon privilege, and I'm not going to stop pointing it out. After all, all those things you call me? They're "just words." I can't imagine the appeal of these. I literally do not know what some people are thinking. Completely off the charts freaky. Wow, you're quick. I just woke up like 20 minutes ago, saw those sneakers on my home page and went "wow, those are not a good idea," went to FB and saw you had posted about them. Too funny. But yeah, topic 1) the sneakers are a terrible and stupid idea and whoever green-lighted them needs to be fired. And topic 2) internet commenters are usually pretty terrible people and I rarely ever read comments after an article because that is where the trolls live lol. Ugh if you actually did your research the sneakers resemble a toy from the 80s. Bloggers like you keep this mentality alive. There are real issues of racism and insensitivity in this world. Yet, people like you choose to react to a sneaker without doing any sort of research. This is irresponsible journalism and it needs to quit. One: I am not a journalist, so this is not "irresponsible journalism." Two: The sneakers may very well resemble a toy from the 80s, but that doesn't mean that they don't ALSO invoke images of slavery and incarceration. Images and media are capable of conveying multiple messages simultaneously. I saw where the designer said he was inspired by My Pet Monster, and that may very well be true, but that doesn't mean that there are some seriously disturbing implications for putting shackles around people's ankles as a statement of fashion (and Adidas clearly recognizes that those problems could impact their bottom line, as they announced they're pulling the design today). Three: The argument that recognizing racism is what keeps racism alive is absolutely ridiculous. I also think it's really hilarious that you provided an example of the very type of argument I was railing against in this post on the post itself: "There are real issues of racism and insensitivity in this world." Yes. I recognize that. Do I think that selling shoes with plastic shackles is as bad as, say, the racial disparities in incarceration rates or job discrimination against people based on the way their names sound? Of course not. But do I think that a culture that subtly perpetuates and defends the use of images like shackles around the ankles for entertainment is one that's going to continue to participate in those more serious practices? Absolutely. Racism does not start as huge, broad-sweeping measures; it starts subtly and culturally pervasively, and people who try to silence others for pointing that out are helping to maintain the entire system. Don't worry about this guy. Only trolls post as Anonymous. This reminds me of the argument that I've so often heard lobbed at English and literary studies in general. Dozens of people, from my father-in-law to complete strangers, have suggested to me that teaching and writing about literature is bogus because it's about "reading something into the text that the author didn't intend." It's the old "why can't the cigar just be a cigar" routine and whether we're talking about Shakespearean studies or contemporary media studies, this narrow line of argument misses the point. It neglects to recognize that we're all (both as consumers of information and as creators of information) enmeshed in cultural systems and ideologies that are so intimate and complex that we're not always capable of abstracting ourselves enough to see or analyze them. But they shape us, they shape us to our core from before we're even born. 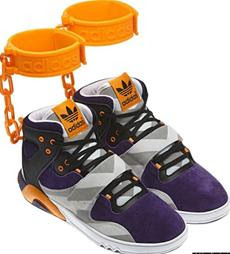 I'm willing to concede that the creator of these shoes didn't *intend* to make an item alluding to slavery and incarceration, but just because there wasn't any conscious or malicious intent doesn't mean that the shoes aren't quite literally chained to a complex (and offensive) web of meaning. Personally, when I first saw the shoes I thought it was some sort of ironic visual commentary on the idea of being a "slave to fashion," as in "haha, our consumers are so smitten that they'll sell themselves into slavery for (and to) our product." And then I started thinking about how it was doubly ironic because the shoes were probably made by the equivalent of modern day child slaves in a third world sweat shop. And then I read the article you posted and thought about these shoes being marketed to black youth, and by then I couldn't imagine the shoes as anything but symbols of the whole sick system of contemporary market capitalism, where it's often hard to tell whether you're the consumer or the one being consumed. Is that what the creator of these shoes intended me to think? No, probably not...in fact, they probably never expected me to see them because I doubt if I was part of the intended consumer demographic. But I'm glad I did see them, and I'm glad there are people out there who are willing to bring this kind of nonsense to light at the risk of stirring up a hornet's nest of haters. Anyway, don't let the angry commenters get you down. Pity the fact that they can't see beyond the ignorance of their own narrow worldviews. They're the ones who are really enslaved. Thank you for this insightful comment, Rebecca! I completely agree, and I think that part of what's so frustrating about the "intention" argument is that it essentially erases our own abilities to think. Yes, the author's intention matters, but so does the audience's interpretation. If you ignore half of that relationship, you essentially set yourself up as a container to be filled without any agency in the transaction. While that might seem easier than critically consuming media messages, to me it's just scary. Amen. And amen. I have gotten particularly discouraged by the push-back from the criticism of the Kraft campaign, probably because as a multiracial person I feel so directly hurt by such irresponsibly racist message. I really just want to say to people: just because you aren't personally offended by something, doesn't mean it isn't offensive or that it is hurtful to other people. I really appreciate my own friends who were honest with me about the Kraft campaign: at first they didn't see what the "big deal" was because of who they are and their background, but once they heard me explain it in a logical, rational way they were totally on board...even if it still didn't necessarily affect them. I just wish other people could be that compassionate and empathetic. Even if something doesn't directly affect me, doesn't mean I can't look at it with a critical eye. Sigh. Mini-rant over. I appreciate your blog and your voice and your willingness to speak out for what you believe in. It will be a sad day when no one is willing to stand up for anything anymore.